I do not recommend installing 9.0.23.32 on production business (corporate) endpoints that use network shares at this time. We have about 15% of our clients having an issue; it's hard to tell the exact number because the symptoms aren't always reported to us. We are rolling back clients that report to 9.0.21.18. If anyone else is seeing this issue, please report in the link I have posted; I would like to gather more data. 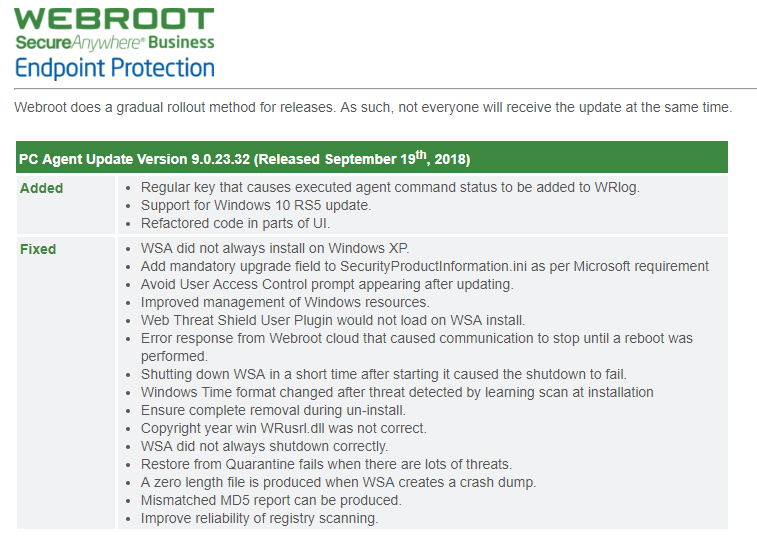 Update on this: 9.0.23.32 was only rolled out to a small number of clients before this issue was reported, and our team has now resolved it with a new build, 9.0.23.34. All agents that received 9.0.23.32 have been automatically updated to 9.0.23.34 to address this. Sorry to hear that you are having to deal with this issue. We have turned off auto updating on all servers due to issues in the past. I just went and turned off all updating on all endpoints till this issue is resolved. I would like to know the informtaiton you are requesting as well.